Abstract - A Design Engineering Request for Proposal is the origination of your data center design, operations program, and any Service Level Agreements (SLAs) whether internal or external. Special attention to crafting your Data Center Design and Engineering RFPs will benefit your long-term operations success, which is the true ROI of your capital investment. 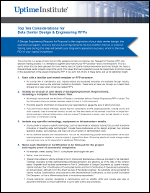 This 10 step guide will help you improve your Request for Proposal (RFP) and procurement decision making process and is gleaned from over 20 years of Uptime Institute experience and direct insight into nearly a thousand data center projects around the world.